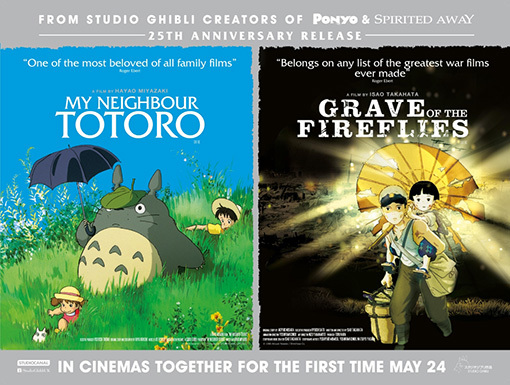 In celebration of the 25th anniversary of the release of Studio Ghibli's acclaimed masterpieces Grave of the Fireflies (Hotaru no haka) and My Neighbour Totoro (Tonari no Totoro), Studiocanal have announced a nationwide UK theatrical release giving audiences a chance to experience a recreation of the original Japanese double-bill feature that first launched these anime classics. An arresting combination from Studio Ghibli's founding fathers: Hayao Miyazaki's My Neighbour Totoro, a lyrical fantasy about benevolent forest spirits, and Isao Takahata's Grave of the Fireflies, the heartbreaking tale of two children’s struggle to survive their firebombed city in World War 2, were launched together in 1988, showcasing the breadth of the anime powerhouse’s range of vision. Seemingly almost polar opposites in subject matter, Miyazaki’s gentle fable and Takahata’s grittier wartime adaptation both perfectly encapsulate the studio's signature motif: its evocation of the wonder and innocence of childhood with their leading young protagonists, and showcase perfectly its defining style impressionistic imagery. Set in Japan during World War II, Grave of the Fireflies focuses on Seita and his little sister Setsuko. After their mother I skilled in an air raid, and with their father serving in the navy, they are forced to fight for survival in the devastated Japanese countryside. Food and shelter are scarce, and even their own relatives are too concerned with their own survival. All they have is each other and their belief that life must carry on. Takahata and his team, including character animator Yoshifumi Kondo, have created a visually stunning and emotionally powerful meditation on the devastating consequences of war. While their mother recovers from an illness, Satsuki and her little sister Mei get away from it all in an idyllic rural retreat. Far from the bustle of the city, they discover a mysterious place of spirits and magic, and the friendship of the Totoro woodland creatures. Conceived as a family film devoid of conflict and suffused with the joy of country living, Mt Neighbour Totoro is a masterpiece for the whole family, uniting the unique vision of Hayao Miyazaki with a feel-good tale of childlike wonder and true originality. Both films will be released nationwide in the UK on 25th May 2013 by Studiocanal.